CBS’ upcoming SUPERGIRL series will be dipping into comic book lore and adapting four-color characters for the small screen. Among them will be the complicated evil-turned-good android Red Tornado — whose powers are about what you’d expect from his name. Now we have our first look at the live-action Red Tornado, and I can tell you… well, he’s red. I’m really concerned about the… texture of this synthetic life form. Are the designers trying to make it look like he’s covered in some kind of rough fabric? Is it supposed to be cardboard? Specialized body armor? Is it supposed to look like his parts are cheaply spray-painted? SUPERGIRL will not premiere on CBS for more than a month yet, so, in order to keep fans interested in the face of GOTHAM and FLASH and ARROW, CBS has released a new SUPERGIRL trailer that showcases some of the more colorful elements of the series. These include Supergirl (Melissa Benoist) demonstrating her powers and views of villains such as Maxwell Lord (Peter Facinelli), Reactron (Chris Browning), Vartox (Owain Yeoman) and Hellgrammite (Justice Leak). So there we saw Kara Zor-El’s heat vision and super breath, and we now know that James Olsen (Mehcad Brooks) and Winn Schott (Jeremy Jordan) both know Kara’s secret identity. I’m not a fan of the more humanized Hellgrammite, but then again, there was probably not much chance of a centipede-looking dude making it on air. Still, I have high hopes for this series. SUPERGIRL debuts Monday, Oct. 26, on CBS. Look! 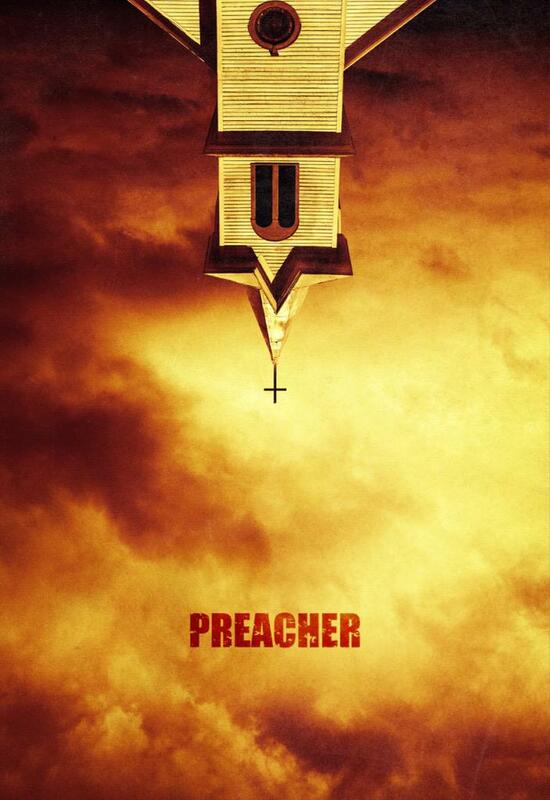 It’s the First Poster for AMC’s Upcoming PREACHER! The very first promotional image for PREACHER, the TV series based on the subversive Vertigo comic book series, has been tweeted by executive producer Seth Rogan! Rogan and Evan Goldberg (This Is the End) will write and serve as executive producers, while Sam Catlin will be the show-runner. Written by Garth Ennis and drawn by Steve Dillon, the Preacher comic book series from Vertigo (home of The Sandman) told the story of Rev. Jesse Custer, a Texas preacher who lost his faith and is possessed by the supernatural entity called “Genesis” who grants him the power of the Word of God, with which Jesse can compel anyone to do his bidding. Jesse learns that God has left heaven, so Jesse sets out to make God answer for abandoning his creation. Meanwhile, a group of angels summon the immortal Saint of Killers to stop Jesse and reclaim Genesis. That upside-down church image makes a whole lot of sense, doesn’t it? Calista Flockhart has joined the cast of CBS’ forthcoming SUPERGIRL series as Cat Grant, a character who has roots in Superman comics. Cat Grant has appeared on-screen before: In LOIS & CLARK: THE NEW ADVENTURES OF SUPERMAN, she was played by Tracy Scoggins, and by Keri Lynn Pratt on SMALLVILLE. SUPERGIRL is being planned for a fall debut. 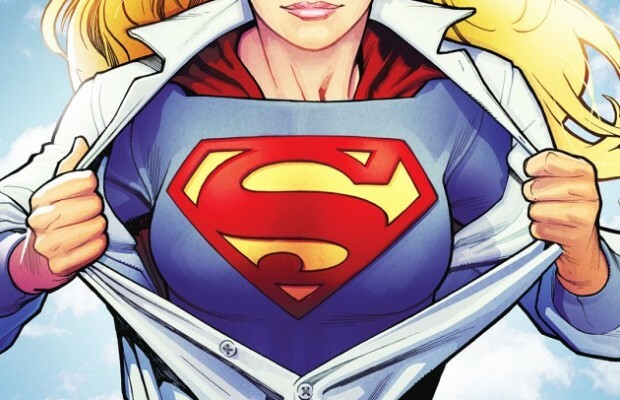 That planned CBS SUPERGIRL series is looking for someone for portray the title character’s cousin, Superman. Technically, the show is looking for a Kal-El “body double,” so Superman might only be seen from a distance or in silhouette, as opposed to actually having lines. According to ProjectCasting.com, the production is looking for someone “5-foot-11 or taller” and “square-jawed,” with “a ripped physique” be portray the double of a “DC Comic Superhero.” How mysterious! But then again, interested parties are told to respond via e-mail with “Superman” in the subject line. The cast already includes Melissa Benoist as Supergirl, Mehcad Brooks as Jimmy Olsen and Laura Benanti as Alura Zor-El. BBC America released a series of character clips this week to hype the April 18 return of its brilliant original series ORPHAN BLACK. In the video series, the clones (all portrayed by the stunningly talented Tatiana Maslany, of course) warn that they are not to be trifled with.